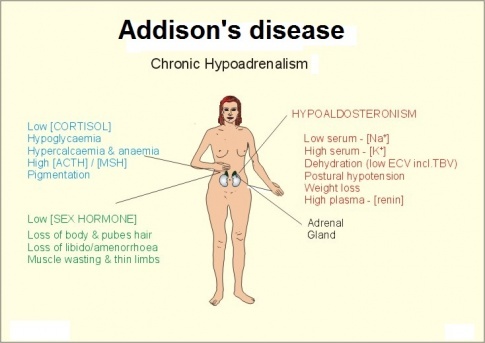 Addison’s disease is characterized by a lack of hormone production by the adrenal glands resulting from damage to the adrenal cortex. The adrenal gland produces too little cortisol and often too little aldosterone. Addison’s disease is also called adrenal insufficiency and can occur in all ages while affecting both genders. Addison’s disease usually develops slowly over several months, but sometimes signs and symptoms can appear rapidly. Addison’s disease can even be life threatening if left untreated. Some signs and symptoms of Addison’s disease include muscle weakness, fatigue, weight loss, decreased appetite, hyperpigmentation, joint pain, and depression. Previous care: Patient has had previous physical therapy for an ACL repair after an injury playing soccer in 2010. Subjective: Jack E. Robinson, a 21 year old Caucasian male who lives with his parents, reports to your clinic with a chief complaint of gradual onset of weakness and fatigue, and pain in his knees. On a 0-10 scale, he states that the pain in his knees is at a 3/10 at best and a 6/10 at its worst. Jack works at United Parcel Service (UPS) at night while attending the local community college during the day. His work duties require him to lift boxes up to 60 lbs. by himself and he has been struggling to do so in recent months, even becoming dizzy and nearly fainting a few times. He has used almost all of his sick days due to feeling nauseous and vomiting while at work and occasionally before coming to work. He reported a slight decrease in his weight and not being hungry nearly as often. He used to stop by the 24 hour Subway for a sandwich every night after work, but only goes one or two times per week in recent months. Now when he goes the sandwiches taste bland and he has to use a lot of salt to make them taste better. He states being nervous about eating certain foods when he is hungry due to diarrhea which he has not figured out the cause of. When asked, he states that his tanned skin from the summer has not faded like it usually does even though it is well into the winter months (January) and that he does not use a tanning bed. He states his parents are worried because he is quick to become irritated with them and rarely comes out of his room when at home. Services: Jack has seen his primary care physician twice since the onset of symptoms and last time was referred to PT with a prescription that said “evaluate and treat for weakness and fatigue”. He has received no other care for his current condition. Patient Goals: increase strength and stamina in order to return to peak performance levels at work and so that workout regimen can resume. Based on the information gathered from the subjective and objective history, the primary hypothesis would be that this patient is suffering from Addison’s disease. The patient complained of unusual fatigue, weakness, frequent diarrhea, a craving of salty foods, decreased appetite, joint pain, and that his tan was lasting longer than usual. Accompanied by objective findings of generalized muscle weakness, low blood sugar, hyperpigmentation of multiple areas of skin, and painful joints during palpation, Addison’s disease would be the most probable diagnosis. We believe this patient would need to be referred to a medical doctor to confirm the presence of Addison's disease and for other treatment outside the scope of physical therapy. This being said, this patient would be a great candidate for physical therapy and would benefit from a muscular strengthening and endurance program. Patient displays generalized muscle weakness, weight loss due to a decrease in appetite, joint pain with palpation and movement, salt cravings, nausea, diarrhea, vomiting, and dizziness. Aerobic exercise will be implemented to address generalized weakness and fatigue. A strengthening program will also be implemented to address the generalized muscle weakness and fatigue. It is recommended that Mr. Robinson attend physical therapy three times a week for six weeks. Physical therapy interventions for Mr. Robinson will be focused on the generalized weakness and fatigue he is experiencing. A strengthening program will be put into effect which will include open and closed chain exercises as well as functional exercises geared toward his position at UPS. Exercise dosage should be focused on increasing muscular strength and hypertrophy to help fight off the affects of musclular weakness and fatigue. The strengthening program will include squats, chest press, shoulder press, bicep and tricep curls, lunge matrix, weighted knee extension, TheraBand® resisted knee flexion, and lifting weighted boxes onto shelves of different heights. He will also need an endurance program to address the excessive fatigue he has been experiencing. This program will include treadmill walking/running, cycling, swimming, and recreational sports as he progresses. A referral to a nutritionist may be necessary to address his decrease in appetite and his fear of eating certain foods. This may also be effective, along with the exercise, in decreasing his episodes of nausea, vomiting and diarrhea. The therapist will also suggest going back to the MD to get more tests done to confirm a diagnosis of Addison's and also prescribe medications and hormones that could get this disease under control while he is at PT. The doctor will most likely prescribe replacement corticosteroids to control the symptoms. Mr. Robinson may also need replacement hormones, such as hydrocortisone or prednisone, to make up for the ones that his adrenal glands can no longer produce. He will need to be educated that these are most likely going to have to be something he takes for life and this is a good way to manage his symptoms and to make sure his condition does not worsen. Due to Mr. Robinson's young age, high motivation, and experience in physical therapy for his ACL repair, his prognosis is very good. The first treatment session went well and Mr. Robinson was surprised how much he was able to do without getting fatigued. The squats and weighted knee extensions had to be discontinued due to knee pain but he was able to complete the lunge matrix. He will benefit from continued skilled PT to continue to work on his functional exercises so that he may return to work with little no fatigue. After 4 weeks of therapy, Mr. Robinson reports no pain in his knees. He has gone back to work and feels confident in all his lifting responsibilities. He continues to feel fatigued, but states that he is continuing to progress and is able to go longer distances on his walks and has progressed to riding the bike for 20 minutes at a time. His nutritionist has him on a meal plan that has decreased his nausea, vomiting and diarrhea and he has been eating his normal amount. The medications and hormones his MD prescribed have helped with the pigment of his skin and also helped with his irritation at home which has made his parents happy as well. As the literature has shown, the main medical treatment of Addison’s disease is glucocorticoid replacement treatments taken 2-3 times per day by the patient. These medications have potential side effects of osteoporosis, obesity and cardiovascular morbidity. Dual release hydrocortisone has also been studied to decrease the need for medication to once per day. As physical therapists, it is our duty to help combat the negative effects of this necessary classification of medicine. An important goal of physical therapy in a patient with Addison’s disease should include patient education on the negative effects of their medication. Patients should also be educated on how exercise has been shown to help prevent the side effects of glucocorticoid medication. With correct doses of medication and a proper exercise prescription by a physical therapist with knowledge of Addison’s disease symptoms, a patient’s quality of life can remain high. ↑ 1.0 1.1 1.2 1.3 1.4 1.5 1.6 1.7 1.8 Addison’s disease: Mayo Clinic Diseases and Conditions. http://www.mayoclinic.org/diseases-conditions/addisons-disease/basics/definition/con-20021340. Published 2013. Accessed March 21, 2015. ↑ 2.0 2.1 2.2 2.3 2.4 2.5 2.6 Addison’s disease: MedLine Plus. http://www.nlm.nih.gov/medlineplus/ency/article/000378.htm. Updated September 25, 2014. Accessed March 21, 2015. ↑ 3.0 3.1 3.2 3.3 3.4 Ross I, Levitt N. Addison's Disease Symptoms - A Cross Sectional Study in Urban South Africa. Plos ONE. January 2013;8(1):1-8. Available from: Academic Search Complete, Ipswich, MA. ↑ 4.0 4.1 4.2 4.3 Ensor, W. Endocrine and Metabolic Disorders. [PowerPoint]. Louisville, KY: Bellarmine University DPT Program; 2015. ↑ Addison’s disease: Medical Assessment Online. http://medicalassessmentonline.com/terms.php?R=5. Accessed March 26, 2015. ↑ Picture of Addison’s disease: MedicineNet. 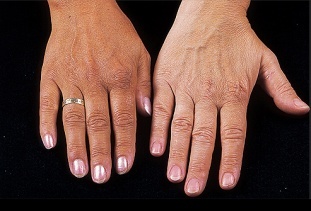 http://www.medicinenet.com/image-collection/addisons_disease_picture/picture.htm. Updated 2015. Accessed March 26, 2015. ↑ Addison’s disease: fastbleep. http://www.fastbleep.com/medical-notes/endocrine-and-breast/23/63/407. Accessed March 26, 2015. ↑ 8.0 8.1 Current practice of glucocorticoid replacement therapy and patient-perceived health outcomes in adrenal insufficiency - a worldwide patient survey. BMC Endocrine Disorders [serial online]. January 2012;12(1):8-15. Available from: Academic Search Complete, Ipswich, MA. Accessed March 26, 2015. ↑ 9.0 9.1 9.2 Giordano R, Guaraldi F, Arvat E, et al. Dual-release Hydrocortisone in Addison's Disease--A Review of the Literature. U.S. Endocrinology [serial online]. Winter2013 2013;9(2):177-180. Available from: Academic Search Complete, Ipswich, MA. Accessed March 26, 2015.